During the week (Sunday night through Thursday night, except holidays), room rates are lower than on weekends (Friday and Saturday nights and holidays). See our availability chart for prices. If you stay for three mid-week nights (Sunday night through Thursday night, except holidays), the third night is 50% off the posted rate. For example, if a room is $159 for each weeknight; the third weeknight would be only $79.50. When making your reservation on our booking page, click Special Rates and then type in coupon code "midweek special" to take advantage of this offer. A $50 nightly discount can be applied for each additional night after the first. Just choose the "$50 off cottage" option while making your reservation. If you don’t want to give your friends and family stuff, but would rather give them an experience, consider a gift certificate for a night at Hopkins Ordinary B&B, or extras like beer from the brewery. We can email it to you, or directly to the recipient if you need it quickly, or drop it in the mail. Gift Certificates can be for any amount and are valid for one year. Just give us a call or purchase online. Please talk to us about creating something special just for your stay. Choose a seasonal floral arrangement to have in your room, with a personalized note, upon arrival. 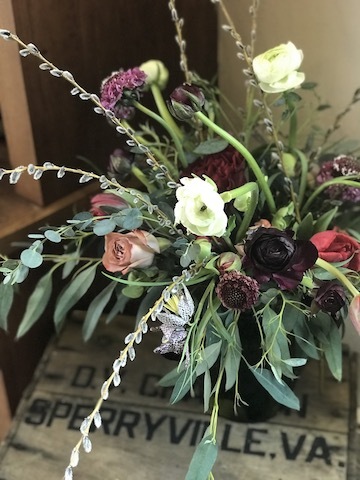 These arrangements are inspired by nature, and include flowers & foliage from the florist's own gardens, local farms & friends. You will be offered the option to add an arrangement to your room when you book on line. Florals will be similar in size & style to the one pictured, but always the florist's choice as to the best available seasonal flowers. For special requests, please contact Jen at Flourish Root Floral Studio at jen@flourishroot.com. Blooms, greenery and natural elements in a bespoke bouquet created especially for your stay. The Thornton contains flowers and foliage with a nod to the season and our local nature in an organic loose style.